Reigning, undefeated WBO middleweight champion Billy Joe Saunders hoped his hugely impressive December statement win over dangerous puncher David Lemieux would finally allow him to nail down a massive fight with either Gennady Golovkin or Canelo Alvarez. Instead, the gifted southpaw today took part in a press conference to hype his upcoming April defence against Martin Murray. A solid foe and challenger the experienced Murray may be (this fight will be the 35 year old’s fifth shot at world glory), but this fight represents a big let-down for all fans who want to see, and were hoping to see, Saunders pit his skills and boxing brain with either of the two biggest names at 160. It’s always a sign when, at a presser to announce one fight, those in attendance are more interested in talking about what may come next, and this was the case today – with the biggest talking point being about Saunders against either GGG or Canelo. 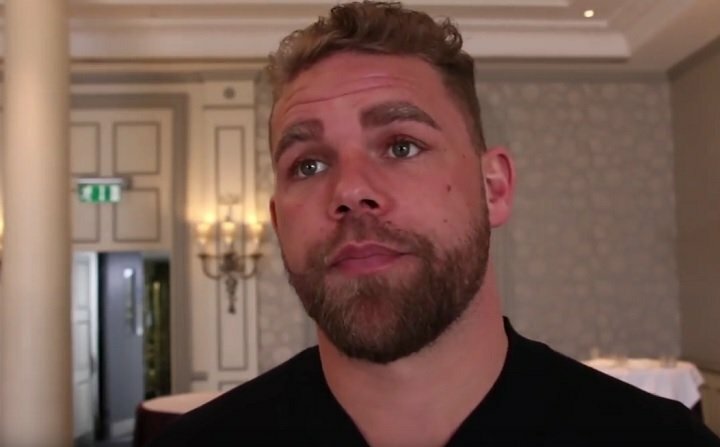 Saunders has respect for Murray, and he even went as far as to say how his countryman brings more of a threat than Lemieux did, but seemingly everyone wanted to talk about those two prospective fights: BJS against either Triple-G or Canelo. And Saunders expressed his frustration in not getting, and maybe never getting, either fight. Promoter Frank Warren says the GGG and Canelo rematch will likely “go the same way as the first fight,” but that hopefully the judges will do their job and find a winner this time. Warren stated without pause how he “knows” Canelo and Golden Boy do not want to fight Saunders, and that GGG is the more realistic fight for his man. Still, right now most fans feel only GGG and/or Canelo are capable of stopping the peaking Saunders. But will the WBO champ ever get the chance to unify the belts?